When it comes to accomplishing things in California, you need to go big or go home. That goes double for the United States Air Force, apparently. The USAF launched the largest rocket ever launches from the West Coast when it fired off a massive Delta-4 Heavy rocket from Vandenberg Air Force Base. Of course, the massive rocket launch was actually meant to be a national secret, or as much of a secret as you can have with a rocket launch. The Delta-4 blasting off from Vandenberg’s Space Launch Complex 6 (or SLC-6) was carrying a top-secret ordinance for the U.S. National Reconnaissance Office. 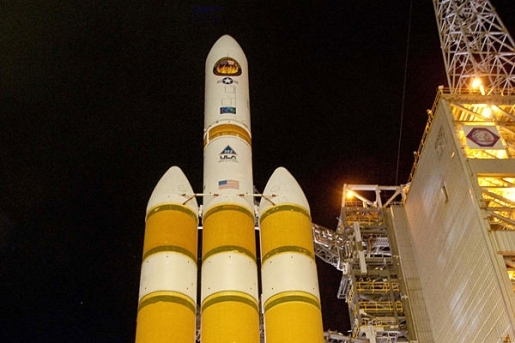 This is the fifth launch of a Delta-4 since it debuted in 2004, and the first launch of the Delta-4 on the West Coast. This is the largest rocket to launch from California since the Titan 4B retired in 2005. The Delta-4 stands 235 feet tall, making it about the size of a 23-story building; it is the largest rocket in use by America’s various space services.